"Not only helps to prevent browning, but it also helps prevent bruising in storage since it completely encloses and protects the avocado." "A stretchy strap holds the cut side of the avocado firmly against the keeper’s surface." "These are designed specifically to fit over the odd-shaped half avocado." "Perfect for keeping the vegetables that are left over after making a small batch of guacamole or salsa." "This hand-held vacuum device is portable, easy to store and affordable." "These wraps are a more natural alternative for storing any kind of food, including those pesky avocados." "This container is designed to press all the air away from the guacamole to prevent browning." Shaped like an avocado, this keeper not only helps to prevent browning, but it also helps prevent bruising in storage since it completely encloses and protects the avocado. 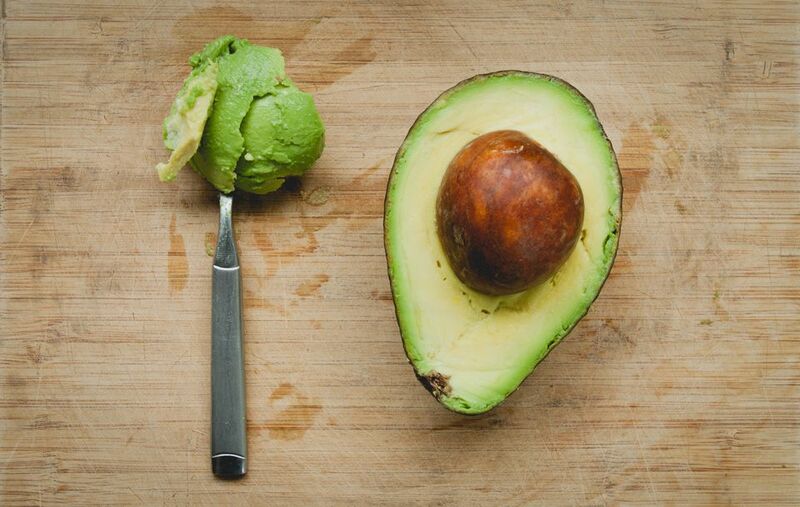 The avocado half is simply placed cut-side down in the container, minimizing the amount of air that reaches the avocado flesh, and then the lid is placed on top. Since the bottom surface is flat, the pit must be removed before storage. This is dishwasher safe for easy cleaning. While it’s shaped like an avocado, there’s no reason you couldn’t use this for other foods as well. This avocado keeper looks like an uncomfortable sandal, and works in a similar fashion, with a stretchy strap that holds the cut side of the avocado firmly against the keeper’s surface. This has a hole for the avocado pit to fit into, keeping the avocado snugly held in place while it rests in the refrigerator for the next meal. While users find that this works well, the stretchy strap can wear and break after many uses. Although there’s a well to accommodate the pit, this can also be used if the pit has been removed. There are a number of different food huggers that are designed to stretch over the cut side of different-sized round-shaped fruits and vegetables, but these are designed specifically to fit over the odd-shaped half avocado. They even have a “pit pocket” that will fit over the pit if it’s left in the cut avocado, or the pocket can be pushed into the hole in the avocado, if the pit has been removed. These come as a set of two to fit smaller or larger avocados. They are made entirely from silicone and are dishwasher safe, but are probably easier to wash by hand. This set of keepers for onion, tomato and avocado are perfect for keeping the vegetables that are left over after making a small batch of guacamole or salsa. They are shaped to fit the vegetables with the cut-side down, with a lid that snaps on to keep the vegetables fresh. These help keep the cut surface of the tomato and onion from drying out, and the totally closed container also helps keep onion smell from scenting the refrigerator. The avocado keeper helps prevent oxidizing and keeps the avocado safe from bumps and bruises in storage. Since the bottom is flat, the avocado needs to be stored with the pit removed. These are dishwasher safe for easy cleaning. While they’re designed to hold specific vegetables, there’s no reason you couldn’t use them to store other vegetables or even leftovers from dinner. Since air is the enemy of avocados, vacuum sealing them makes a lot of sense. You could certainly use a vacuum sealing machine, but this hand-held vacuum device is portable, easy to store and affordable. With this sealer and the special zipper bags, you can open the bag, use some of the avocado and reseal the bag so you can use 1/4 of it at a time, or even save slices or chunks. While the bags are not designed to be washed and reused (washing causes the seals to fail after a few uses), users have been able to extend the life of the bags by placing food inside a standard zipper bag left unsealed, then placing that inside one of the vacuum-sealer bags for storage. Since the vacuum bags don’t make contact with the food, they can be wiped clean rather than washed. If you already have a Foodsaver vacuum sealing machine, the bags can be used with that machine as well. Of course, these aren’t just for avocados, and can be used for deli meats, vegetables, fruits, cheeses and more. Ideal for people who are trying to eliminate the use of plastics, these wraps are a more natural alternative for storing any kind of food, including those pesky avocados. The two smallest sheets with a honeycomb print are the perfect size for avocados. The set also includes two medium sized sheets, two large sheets and one very large sheet for wrapping a loaf of bread or covering a casserole. These are simple to use. The warmth of your hands softens the wrap and creates a seal, then the sheets firm up again and hold their shape until you’re ready to unwrap. The beeswax and jojoba oil embedded in the cotton cloth have antimicrobial properties that help keep foods fresh. These should be washed by hand with cool water and mild dish soap, then air dried for the next use. Let’s face it, most avocados are used for guacamole and that leftover guacamole is just as difficult — or possibly more difficult — to keep fresh in storage. This container is designed to solve that problem. It presses all the air away from the guacamole to prevent browning. Made from BPA-free plastic that’s shatterproof, odor proof and stain resistant, this can be used for other dips, salsas, sauces and food storage when you don’t happen to have leftover guacamole to preserve. It can also be used for serving, so you can make guacamole in advance and it will be ready to serve when you’re ready to snack. This avocado storage option is top-rack dishwasher safe.